C.4.1–C.4.5 Tabun (GA), Sarin (GB), Soman (GD), GF, and VX Nerve agents are among the deadliest of chemical agents and many produce rapid symptoms. They include the G- and V-agents. Examples of Gagents are tabun (GA), sarin (GB), soman (GD), and GF. A V-agent is VX. In some countries “VF” agents are known as “A” agents. a terrorist in the form of an aerosol tank or can. Small Exposure: miosis, rhinorrhea, mild difficulty breathing. Large Exposure: sudden loss of consciousness, convulsions, apnea, flaccid paralysis, copious secretions, miosis. Liquid on Skin: Small to Moderate Exposure: localized sweating, nausea, vomiting, feeling of weakness. Large Exposure: Sudden loss of consciousness, convulsions, apnea, flaccid paralysis, copious secretions. Detection: M256A1, CAM, M8 paper, M9 paper, M8A1 and M8 alarm systems. Decontamination: M291, M258A1, hypochlorite, large amounts of water. Management: Administration of Mark I kits (atropine and pralidoxime chloride); diazepam in addition if the casualty is severe; ventilation and suction of airways for respiratory distress. 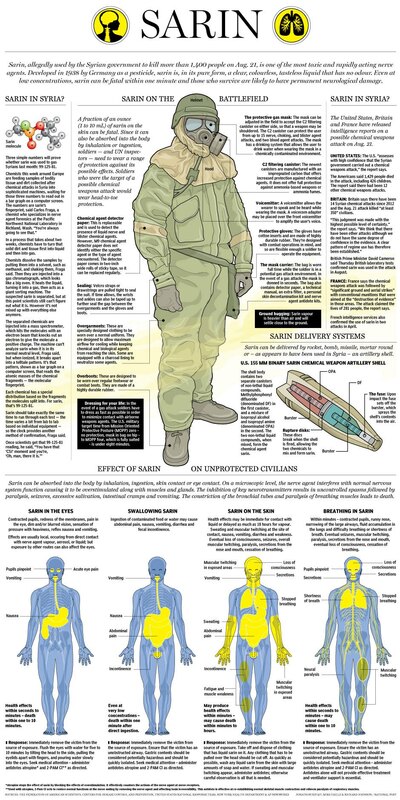 Nerve agents are the most toxic of known chemical agents. They are hazards in their liquid and vapor states and can cause death within minutes after exposure. Nerve agents inhibit acetylcholinesterase in tissue, and their effects are caused by the resulting excess acetylcholine. READ NEW US STRATEGY AGAINST ISIS AND WAR IN SYRIA. WHAT TO EXPECT? decreases after atropine administration, after which ventilation will be easier. bromide is used in the pretreatment for nerve agents. to restore the normal activity of the enzyme. activity and reduce the brain damage caused by prolonged seizure activity. 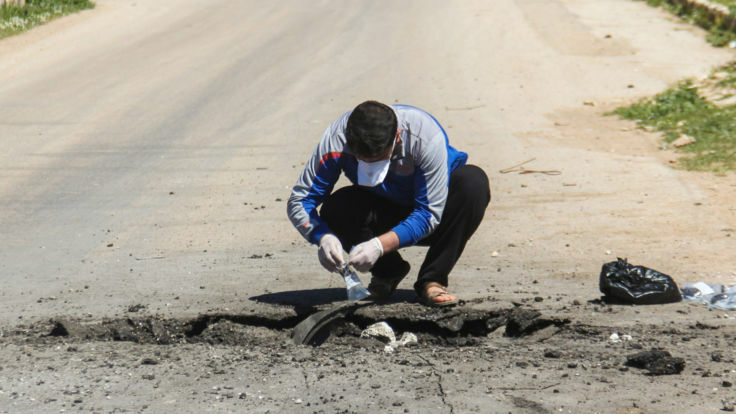 On 4 April 2017, Sarin was initially proposed as the gas used to carry out an attack by the Syrian Assad regime in the village of Khan Shaykhun in Idlib (Syria). The attack has caused more than 60 dead and over 170 injured. According to Russian sources, however, the dispersion of the gas in the air was caused by the bombing that would have been perpetrated by the aviation loyalist a stock of chemical weapons in the hands of the militias of the Islamic State: Words denials by the Turkish sources, indicating instead as Daesh (ISIS) had no chemical storage there. It must also add that – the analysis of films made by rescuers shortly after the incident – were noted several incompatibilities with the use of a gas such as sarin nervico (such as the lack of muscle spasms in still dying victims or rescuers which however are able to work without any problems, despite the absence of caps) which have led to the hypothesis instead the use of a gas with a suffocating effect (eg. chlorine-based and / or phosgene).